Can we build healthy communities while building healthy local economies? Award-winning chef, Michel Nischan, and food policy expert, Gus Schumacher, think the answer is “yes.” So they founded Wholesome Wave. Food assistance benefits average only about $1.41 per person, per meal. That makes healthy, local food unaffordable for families at or near the poverty line. To help vulnerable families improve their diet, Wholesome Wave has a combination of programs. 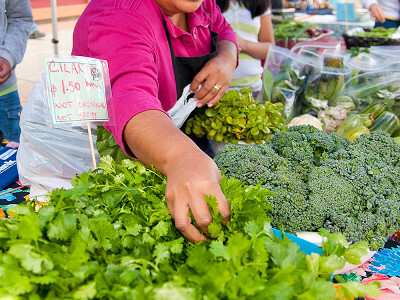 Families can receive double the amount of SNAP benefits when they’re used on fruits and veggies at local markets. Another initiative encourages hospitals to help patients at risk for diet related illnesses get healthy foods. And Wholesome Wave connects institutions with local food suppliers to broaden the reach of better nutritional options. Armed with the resources to start making healthier food choices, these same communities are also helping support local farmers. Making the food system more inclusive is changing lives and local economies—just as Michel and Gus had hoped. Hi everyone, I’m Gabrielle from Wholesome Wave. Our mission is to enable under-served community members to make healthier food choices by making fresh, locally grown fruits and vegetables affordable and available. My team and I are excited to share our story here on The Grommet. What inspired the founders, Michel Nischan and Gus Schumacher, to start Wholesome Wave? 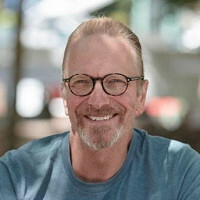 Our CEO and co-founder, Michel Nischan, has always had deep-seated values in local agriculture and he applied those principles throughout his career as a James Beard Award-winning chef. He and Gus Schumacher, co-founder and former Under Secretary of Agriculture, met several years back and began a discussion about fixing our food system that resulted in the foundation of Wholesome Wave. They both brought their passion for a more inclusive food system and expertise in nutrition and policy, respectively, to start making an impact in local communities. You guys took food as medicine to a whole new level. What feedback have you received from the Fruit And Vegetable Prescription (FVRx) program? We’ve received positive feedback from both participating hospitals and patients. Medical providers report that FVRx helps them do their jobs better. Since the program combines medical advice and nutrition counseling with the resources to make fresh fruits and vegetables affordable, doctors felt that it opens up lines of communication on true barriers to healthy eating and empowered patients to take action to begin changing their diets. Overall, we’ve seen that the program is indeed working—helping medical providers and patients start preventing and treating chronic diet-related disease by promoting affordable access to fruits and vegetables and healthy eating. Wholesome Wave is clearly impacting individual’s health, how else is the organization impacting communities? First and foremost, our work is helping strengthen our local farming communities through the increased demand generated by empowering more consumers to buy locally and sustainable. Our successful community-based initiatives, advocacy work, as well as data collection and evaluation, are also helping advance policies that improve the food system. We pilot and prove that certain social programs can work, then work to make them available and supported nationally. Can we build healthy communities while building healthy local economies? Award-winning chef, Michel Nischan, and food policy expert, Gus Schumacher, think the answer is “yes.” So they founded Wholesome Wave. Food assistance benefits average only about $1.41 per person, per meal. That makes healthy, local food unaffordable for families at or near the poverty line. To help vulnerable families improve their diet, Wholesome Wave has a combination of programs. 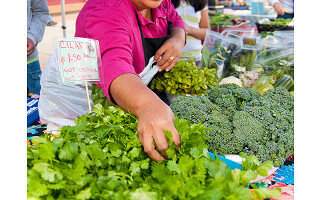 Families can receive double the amount of SNAP benefits when they’re used on fruits and veggies at local markets. Another initiative encourages hospitals to help patients at risk for diet related illnesses get healthy foods. And Wholesome Wave connects institutions with local food suppliers to broaden the reach of better nutritional options.